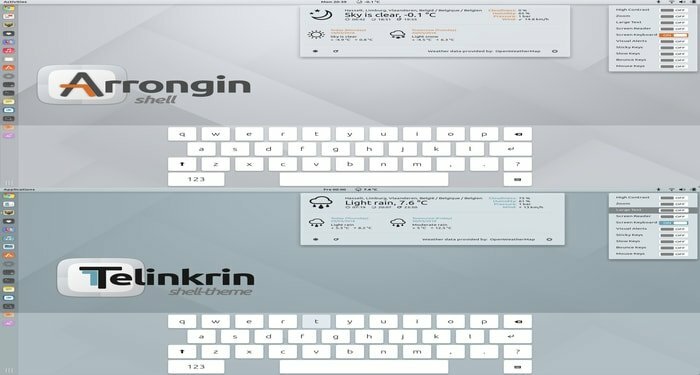 Arrongin and Telinkrin are two variant colors GTK themes for Ubuntu Linux which is based on or inspired by the popular Ubuntu default theme – Ambiance. These two themes are totally refined and redesigned of Ambiance Theme. This is one of first gtk theme which supports latest Ubuntu version. These two themes are persistent to the smallest detail and give a new and modern look to Nautilus and Tweak-tool. Arrongin and Telinkrin GTK Theme seemingly integrates into Gnome environment with the Shell-theme, background, and icon-theme which really look consistent. You can have a close review of these two themes on YouTube – made by Charlie Henson. The Shell Theme is really amazing and icon theme a mix of adwaita and MySuru iconset. The Arrongin icon-theme and Telinkrin iconset are both designed based on MySuru iconset but few icons are re-colored to meet the combined appearance with Gnome system. There are few issues with resizing the sidebar in nautilus and Window-buttons-layout (min/max/close) remains on the right side. No support for left side at this moment.